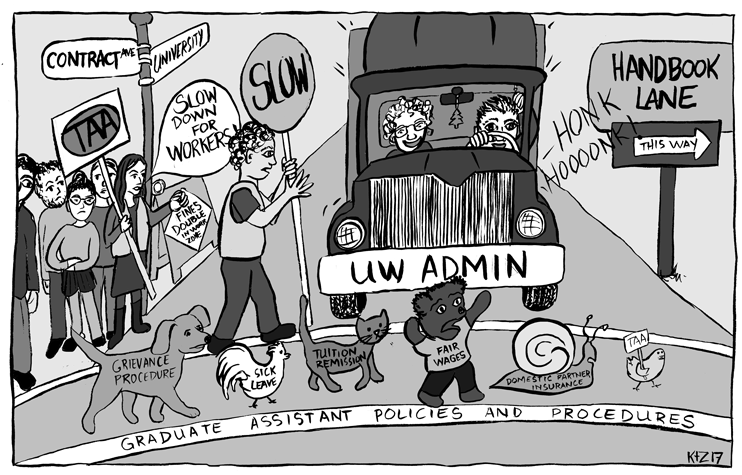 On October 8th, members of the TAA bargaining team met with members of UW administration to discuss converting the grievance procedure in our collectively bargained contract into university policy. Members of the TAA bargaining team reiterated their commitment to creating a policy that is clear, accessible and comprehensive in its protection of graduate workers. In the coming weeks the committee will systematically review the former grievance procedure and recommend updates. If you have had experiences such as overwork, misclassification, intimidation, or other workplace problems and concerns, we encourage you to come share your opinions and experiences at these meetings. We are the people living these policies, so we need to connect to our administrators what the policy language means for our lives.